Jake “The Bull” Bagley has had a mythical reputation within the Maine wrestling community for well over a decade, but when he made his mixed martial arts (MMA) debut at “NEF 37: Sub Zero” on February 1st in Bangor, a whole new legion of fans learned his name—fight fans. That’s because Bagley, a multiple-time state champion wrestler, brought the house down in his back-and-forth, fist-tastic battle with Canada’s Brady Macdonald. 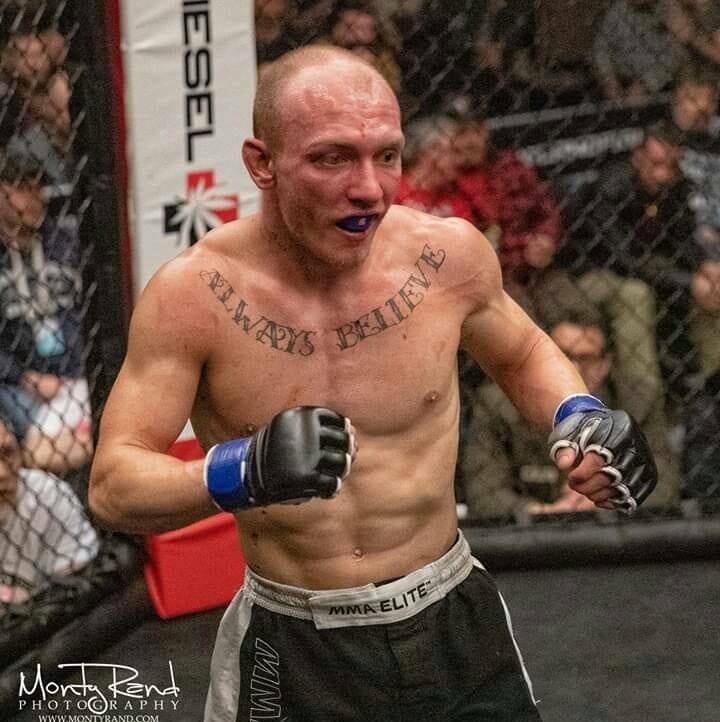 Bagley discussed his NEF MMA debut recently with Bryan Stackpole and Ryan Jarrell on the Between Rounds Radio podcast. Bagley, now 25-years-old, grew-up wrestling for perennial powerhouse Noble High School in North Berwick, Maine, where he won two state championships. During his time on the mat, Bagley earned a reputation as a relentless competitor that never hesitated to bump up in weight to face the toughest challengers he could find at both the state and national levels. Blessed with a relentless desire to constantly test his abilities, Bagley’s interests naturally progressed to MMA at a young age. Bagley’s NEF debut earlier this month came against a fighter that had proven himself to be a wrestler’s kryptonite. Canada’s Brady Macdonald needed only 15-seconds to force multiple-time New Hampshire state champion Greg Waterbury to tap when he debuted with the promotion in June 2018. Early into his bout with Bagley, it looked like history might repeat itself when Macdonald was able to secure Bagley’s back during the first round. Bagley, however, would have none of it. Bagley fought off the choke and then, the fight was on. A frenetic, high-paced free-for-all followed that had all 1200 fans in the building on their feet. “As soon as I realized how hard he could hit, I had no fear—I was going forward,” Bagley stated. One of the most dangerous moments of the fight for Bagley came when he found himself caught in a deep heel hook. Now, a couple of weeks removed from his head-turning debut, the bumps and bruises have healed, but for Bagley—and the fans that were fortunate enough to witness it—the magic of the moment has not been forgotten. “I’ve wrestled on a couple of national stages, but the emotion and the stuff after that fight… I still feel it today,” Bagley said. Once again fully committed to a competition lifestyle, Bagley is ready to start racking up the wins the same way he did on the wrestling mat.